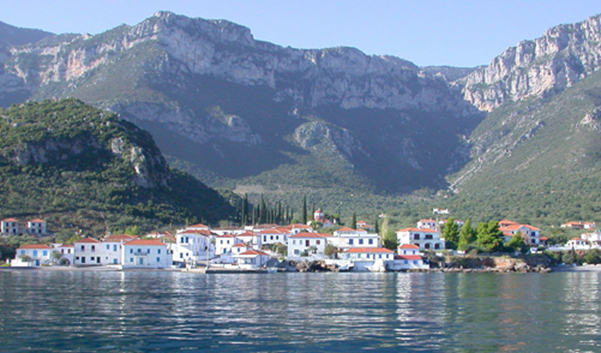 Tony Julius left his tiny, isolated village of Kyparissi, Greece, at the beginning of the 20th century, seeking a better future in the United States. But he never forgot his roots. Today, through a legacy fund managed by KBFUS, his memory lives on, making life better for the residents of Kyparissi and helping to put the village on the world map. Backed by the craggy slopes of Mount Parnon and fronted by the cobalt blue Myrtoan Sea on the northeast coast of Greece, Kyparissi is a secluded seaside village of breathtaking beauty. The small community of just 400 residents relies on farming and fishing, olive oil production, beekeeping and summer tourism. Until the 1970s, Kyparissi was accessible only by sea or by foot down a steep mountain path. Today, there is just one very dangerous dirt road that winds treacherously around cliffs and through ravines to connect the village with the nearest town of Molai, about one hour away. This was where Tony Julius was born and raised. Although he lived in California for most of his adult life, he loved his home village so much that he decided to leave the majority of his estate to a legacy fund that would support Kyparissi in perpetuity. The Tony Julius Fund, which has been managed as a KBFUS legacy fund since 2011, has an endowment of just over US$550,000. The annual revenue supports initiatives benefiting Kyparissi residents. To ensure that funds go where they are needed most, KBFUS partnered with the Bodossaki Foundation, one of Greece’s most respected foundations and a member of the European Foundation Centre. Working closely with Kyparissi’s local community leaders, the Bodossaki Foundation determines current and future needs and identifies funding opportunities. “Our community contacts are people who interact daily with Kyparissi residents and have a clear and ongoing view of the basic needs that are required to maintain and improve living standards,” says Laganopoulos. Since 2011, projects have included supporting the village’s needy individuals as well as maintaining and developing public infrastructure such as the church, the school, the doctor’s office, the water supply system and tourist hiking and rock climbing trails. With one small primary school, and no high school, most people with children go to Athens for the winter, although some stay year-round. But the school was in desperate need of upgrades for the children who attend. The school itself has an interesting history, he adds. It was built by Ernst Moritz Theodor Ziller, a German architect who became a Greek national. In the late 19th and early 20th centuries, he was famous across Europe for designing royal and municipal buildings. Despite the small population, the village has about a dozen small hotels. Princess Diana visited before her death. George H.W. Bush, the 41st President of the United States, has also holidayed there. Recently, the Fund has supported the upgrading of climbing routes around the village through the Kyparissi Bolting Project. “I would say that one of the most important initiatives the Fund has supported was the drilling of 80 climbing routes in the mountain peaks around Kyparissi,” says Laganopoulos. Thanks to the new routes, the tourism period has been extended, running from April through November. All initiatives aim to help the Kyparissi community either at an individual or a group level. For example, the mother of one resident with severe physical and intellectual disabilities received support to help cover part of the cost of dental treatment and services at the Institution for Children with Special Needs. The Fund also helped pay for dialysis treatment for another low-income resident who suffers from kidney disease. Healthcare is a huge challenge in Kyparissi. The village does not have a permanent doctor and the nearest hospital is more than one hour’s drive away in Molai. “We did some repairs to the doctor’s office and covered the rent of an apartment so a visiting doctor could stay for several days a month,” says Laganopoulos. KBFUS can help you establish a legacy fund that will make gifts in your name, in perpetuity or for a specific number of years, to support the causes or organizations you love, anywhere in Europe or Africa. You can focus on the issue that matters most to you — such as advancing women’s rights in Morocco, promoting entrepreneurship in South Africa, stimulating research in Greece or preserving cultural treasures in teh city of Antwerp, Belgium. Or you can handpick a beneficiary organization, such as the university where you studied or a museum you cherish. When establishing a legacy fund, you can select one of our four investment pools for the allocation of the assets of your fund. If you prefer, you may recommend that the assets be managed by an investment advisor of your choice. Contributions to a legacy fund can be made during the donor’s lifetime and/or through a charitable bequest. Because KBFUS is a Section 501(c)(3) public charity, donors receive the maximum charitable tax deductions allowable by law for income or estate tax purposes. Laganopoulos says that the Bodossaki Foundation considers KBFUS to be one of its closest partners.